Introduction: Colorectal Cancer (CRC) is one of the most leading causes of cancer related mortalities and metastasis is the main cause of death in CRC patients. Versican (VCAN) is an Extra Cellular Matrix (ECM) proteoglycan that is involved in tumor progression and cancer metastasis. The overexpression of VCAN has been observed in some cancer. Objective: In this study we aimed to analyse VCAN gene expression in patients with colorectal cancer to investigate its association with patients clinico-pathological features. Materials and Methods: We collected CRC tumors and the adjacent normal tissues from 72 Iranian patients. To measure VCAN gene expression level, Real time RT-PCR was performed. Results: VCAN gene expression level is significantly increased in tumor samples compare to the adjacent normal tissues with 2.6 change in fold and also there is a significant association between VCAN gene over expression in patients with CRC stage IV and lymph node positive. Conclusion: VCAN gene is correlated with invasion and metastasis of CRC and has a capability as a candidate prognostic marker in patients with colorectal cancer. Colorectal Cancer (CRC) is the third common cancer and the second leading cause of cancer related mortalities among females and males. Approximately 56% of colorectal cancer patients die cause of colorectal cancer [1,2]. A simple definition of cancer biomarker is an objectively measurable and evaluable as an indicator of cancerous processes biological molecules that produced by either the cancerous cells or tumoral tissues in the patient's body . Metastasis is the main cause of death in CRC patients. More than 20% of diagnosed colorectal cancer patients would have metastasis in their life . According to the TNM staging, colorectal cancer patients with metastasis to the other organs are classified in stage-IV and 5 year survival rate for patients with colorectal cancer in this stage is less than 10% . Nowadays one major efforts on cancer research is to identify molecular markers for evaluate CRC metastasis. The alteration of Extracellular Matrix (ECM) proteins has been reported in many cancers. Versican (VCAN) as an extracellular matrix protein is a chondroitin sulphate proteoglycan that plays a key role in tumor malignancy and progression . The role of versican as a main component of extracellular matrix is involved in cell adhesion, extracellular matrix assembly, cell migration and cell proliferation . The upregulation of versican has been observed in a wide range of cancer such as breast , prostate , melanoma , pancreatic  and other cancers. In addition in a study on CRC by immunohistochemistry on VCAN protein revealed that VCAN was a strong prognostic indicator in stages II and III colon cancer . VCAN gene is located on chromosome 5q that transcribed into four VCAN mRNA variants. Studies show VCAN overexpression is associated with tumor development, cancer invasion and cell motility, also it is a candidate as a prognostic marker for cancer metastasis . Thus the presented study was aimed to analyse VCAN gene expression in Iranian colorectal cancer patients and highlight its relation with clinico-pathological characteristics of tumor in 72 colorectal cancerous tumors and adjacent normal tissues. Seventy two colorectal tumor and the adjacent normal tissues from Iranian colorectal cancer patients were collected from Hazrate-Rasoul hospital during 2014-2016 years. After surgery and resection of the tumor, fresh tissues consist of tumor and adjacent normal tissue was collected in separated sterile tubes. The patients had not yet received any chemotherapy treatment. Tissue samples were frozen and stored at -70°C. All patients clinico-pathological information were obtained from pathology department of Hazrate-Rasoul hospital. The tumors staging were determined by pathologist according to TNM staging. Tissue samples were collected and histological characteristics of the tumors were confirmed by two pathologists. RNA was isolated from 100 mg tissue with using Tripure Isolation Reagent (Roche Applied Sciences, Indianapolis, USA). RNAs quality and optical density were checked by nanodrop (ThermoScientific, USA) and 1% agarose gel electrophoresis. Then RNAs were synchronized according to the optical density and according to the concentration of RNAs first-strand cDNA was synthesized as the manufacturer’s protocol (Thermo scientific kit). To evaluate VCAN gene expression level we used GAPDH as internal control gene. Real-time RT-PCR was performed by a Rotor gene 6000 (Corbett Research Pty. Ltd., Australia) system with Fast-Start DNA Master SYBR-Green I kit (YTA, Iran). The total volume of the PCR reaction for all samples was 10 μL contained 5 μl SYBR Green PCR master mix, 0.5 μl of each primer (10 μmol/l) and 2 μl template (1000 ng/μl). Samples for no-template were also included in each test to detect any contamination. For calculating the gene expression level Linreg program and Livak method were used . Primers were designed basis of exon–exon junction pattern and specifically for four variants of VCAN mRNA. Primers sequences are shown in Table 1. For confidence accuracy and specificity of real time PCR, the PCR products were checked on 1.5% agarose gel. Table 1. Sequences of VCAN and GAPDH primers. The data were analysed using the Statistical Package for Social Sciences (SPSS version 22) software. K-S test was applied for identifying the data distribution type. Mann Witney-U test was used for comparison of means between two groups and Kruskal-Wallis test was used for comparison of means among three or more groups. The patients and tumor features gathered from the pathology department of Hazrate-Rasoul hospital. The average age of all patients and SD were 56 ± 10 y. Patients were categorized in two groups according to lymph nodes status consist of lymph nodes positive and negative. All colorectal cancer stages (Stages I-IV) were seen among our patients. Also we categorized the patients information into two genders and four kinds of tumor sizes. The information of the patients and tumor features are shown in Table 2. †Histological grade comparison has performed between two groups contain low and high grade. Table 2. All of 72 Patients and tumor characteristics that used for VCAN gene analysing in this study. Our results indicated an over-expression in VCAN mRNA expression level in colorectal cancer compare to the adjacent normal tissue. The mRNA mean expression level of VCAN gene in tumor compare to the adjacent normal tissue was calculated 0.002 ± 0.0038 and 0.0008 ± 0.0014 respectively (2.6 fold change). Figure 1 shows VCAN gene expression in tumor samples and adjacent normal tissue. Figure 1: VCAN mean expression level. 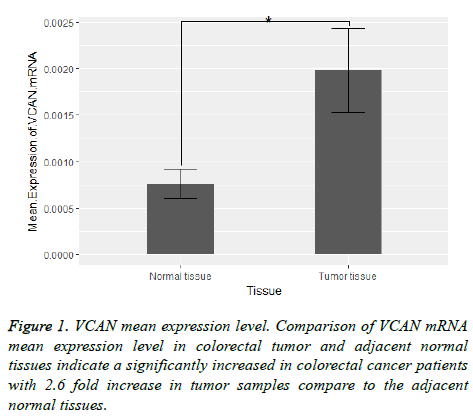 Comparison of VCAN mRNA mean expression level in colorectal tumor and adjacent normal tissues indicate a significantly increased in colorectal cancer patients with 2.6 fold increase in tumor samples compare to the adjacent normal tissues. Also we found a significant relation between VCAN gene expression fold change with lymph node involvement and tumor stage of colorectal cancer with the p-value=0.003 and pvalue= 0.001 respectively. Figure 2 shows a comparison between VCAN gene expression fold change with lymph node positive and lymph node negative samples and in Figure 3 we depicted the gene expression fold change between tumor stages of colorectal cancer. To evaluate the gene expression fold change each tumor sample was normalized with the adjacent normal tissue. Figure 2: VCAN associated with lymph node metastasis in CRC patients. Comparison of VCAN fold changes between colorectal cancer lymph node status. VCAN gene expression fold change is significantly increased in lymph node positive compare to lymph node negative samples with p-value=0.003. Figure 3: VCAN associated with tumor stage in CRC patients. Comparison of VCAN fold changes between colorectal tumor stages. Mean comparison test between groups showed a significant increase in the gene expression fold change between tumor stages with p-value= 0.001. To highlight the potential of VCAN gene as a prognostic marker for CRC metastasis; ROC curves portray for samples with metastasis to liver (Samples with tumor stage-IV) and lymph node status which depicted in Figures 4 and 5. The Area Under Curve (AUC) were calculated 0.838 and 0.701 respectively. Figure 4: ROC curve for lymph node positive and lymph node negative patients. 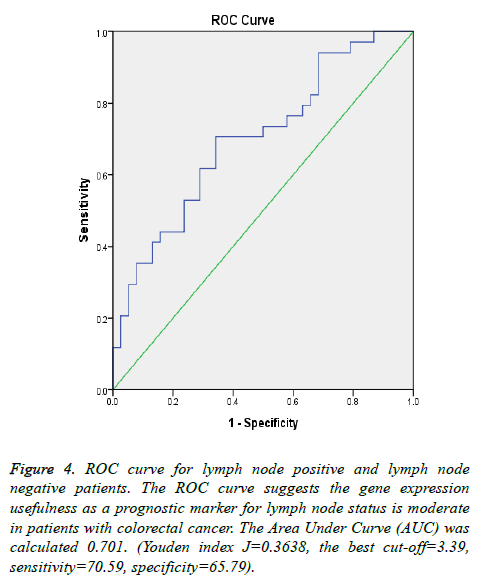 The ROC curve suggests the gene expression usefulness as a prognostic marker for lymph node status is moderate in patients with colorectal cancer. The Area Under Curve (AUC) was calculated 0.701. (Youden index J=0.3638, the best cut-off=3.39, sensitivity=70.59, specificity=65.79). Figure 5: ROC curve for patients with metastasis to liver (Stage-IV) and patients without long distance metastasis. 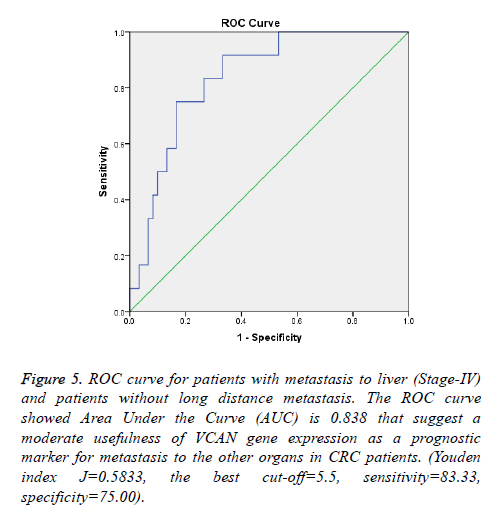 The ROC curve showed Area Under the Curve (AUC) is 0.838 that suggest a moderate usefulness of VCAN gene expression as a prognostic marker for metastasis to the other organs in CRC patients. (Youden index J=0.5833, the best cut-off=5.5, sensitivity=83.33, specificity=75.00). Extracellular Matrix (ECM) proteins are considered as crucial factors in cancer development. The alteration of ECM protein expression has been reported in many cancers . Versican (VCAN) is a major component of the extracellular matrix. Due to the alternative RNA splicing of VCAN gene, this gene is transcribed into four mRNA variants and each mRNA variant translate to an isoform of versican protein . VCAN is expressed widely in nervous systems and growing cells that indicate a key role of versican in cell proliferation process. There are some studies that suggest VCAN is involved in cancer invasion and metastasis [5,16]. VCAN gene expression is altered in human melanoma . Also versican rich condition will influence on prostate cancer cell adhesion to fibronectin then VCAN expression may has an effect on prostate cancer cell adhesion to the ECM . There is a relation between versican with prostate cancer metastasis . Studies on pancreatic cancer show the greatly increased in versican expression is associated with the malignancy of the tumor . 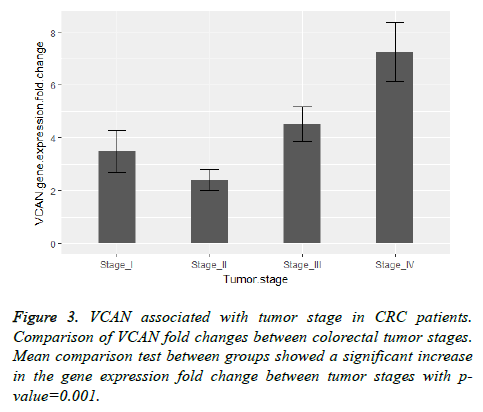 VCAN influences on metastatic phenotype in renal carcinoma  and human bladder cancer cell lines . A study on VCAN protein indicates there is an associate between the protein levels with disease recurrence in CRC . Also there is a study on colorectal cancer that Pitule et al. found VCAN gene as one out of 10 genes that is related to CRC metastasis . In the present study we analysed VCAN mRNA expression level in 72 colorectal cancer samples. Our samples consist of colorectal tumors and the adjacent normal tissues. We investigated a significant over expression with 2.6 fold change in VCAN mRNA level in CRC compare to the adjacent normal tissues. The gene expression analyzing and its association with patients clinico-pathological features showed a significant relation between the expression of VCAN with CRC tumor stages and lymph nodes status. As shown in Figures 2 and 3 the comparison of VCAN fold changes between patients group there is a significant increase in the gene expression in CRC stage-IV and lymph node positive samples. In Figure 5 we depicted ROC curves to elucidate VCAN gene potential as a prognostic marker for metastatic phenotype of CRC. Area under the curve for CRC stage-IV with other three stages of the disease was calculated 0.838 and for lymph node positive with lymph node negative status was calculated 0.701 that suggested moderate usefulness of VCAN as prognostic marker for metastasis in CRC patients. In our study there was no significant association between VCAN expression in CRC patients and other clinicopathological features including age, gender, histological grade and tumor size. In conclusion our results indicate the importance of VCAN in invasion and metastasis of colorectal cancer. Also we found the capability of VCAN gene as a candidate prognostic marker in patients with colorectal cancer. All procedures performed in the study involving human participants were in accordance with the ethical standards of the institutional and national research committee and with the Helsinki declaration and its later amendments or comparable ethical standards. Cancer NCCF. Investigation, diagnosis and staging. NIH 2011. Riihimaki M, Hemminki A, Sundquist J, Hemminki K. Patterns of metastasis in colon and rectal cancer. Sci Rep 2016; 6: 29765. Mordente A, Meucci E, Martorana GE, Silvestrini A. Cancer biomarkers discovery and validation: state of the art, problems and future perspectives. Adv Cancer Biomark Spring 2015; 9-26. Byers LA, Holsinger FC, Kies MS, William WN, El-Naggar AK, Lee JJ, Hu J, Lopez A, Tran HT, Yan S, Du Z, Ang KK, Glisson BS, Raso MG, Wistuba II, Myers JN, Hong WK, Papadimitrakopoulou V, Lippman SM, Heymach JV. Serum signature of hypoxia-regulated factors is associated with progression after induction therapy in head and neck squamous cell cancer. Mol Cancer Ther 2010; 9: 1755-1763. Du WW, Yang W, Yee AJ. Roles of versican in cancer biology-tumorigenesis, progression and metastasis. Histol Histopathol 2013; 28: 701-713. Ricciardelli C, Sakko AJ, Ween MP, Russell DL, Horsfall DJ. The biological role and regulation of versican levels in cancer. Cancer Metastasis Rev 2009; 28: 233-245. Ricciardelli C, Brooks JH, Suwiwat S, Sakko AJ, Mayne K, Raymond WA. Regulation of stromal versican expression by breast cancer cells and importance to relapse-free survival in patients with node-negative primary breast cancer. Clin Cancer Res 2002; 8: 1054-1060. Sakko AJ, Ricciardelli C, Mayne K, Suwiwat S, LeBaron RG, Marshall VR. Modulation of prostate cancer cell attachment to matrix by versican. Cancer Res 2003; 63: 4786-4791. Touab M, Villena J, Barranco C, Arumí-Uría M, Bassols A. Versican is differentially expressed in human melanoma and may play a role in tumor development. Am J Pathol 2002; 160: 549-557. Skandalis SS, Kletsas D, Kyriakopoulou D, Stavropoulos M, Theocharis DA. The greatly increased amounts of accumulated versican and decorin with specific post-translational modifications may be closely associated with the malignant phenotype of pancreatic cancer. Biochimica et Biophysica Acta General Subj 2006; 1760: 1217-1225. Chida S, Okayama H, Noda M, Saito K, Nakajima T, Aoto K. Stromal VCAN expression as a potential prognostic biomarker for disease recurrence in stage II-III colon cancer. Carcinogenesis 2016; 37: 878-887. Du WW, Fang L, Yang W, Sheng W, Zhang Y, Seth A. The role of versican G3 domain in regulating breast cancer cell motility including effects on osteoblast cell growth and differentiation in vitro-evaluation towards understanding breast cancer cell bone metastasis. BMC Cancer 2012; 12: 341. Motalebzadeh J, Mahjoubi F, Nafissi N, Hashemian M, Taheri M, Hosseinpour Y. FBLN-4 and BCRP genes as two prognostic markers are downregulated in breast cancer tissue. Cancer Biomarkers 2017; 1-5. Wu YJ, La Pierre DP, Wu J, Yee AJ, Yang BB. The interaction of versican with its binding partners. Cell Res 2005; 15: 483-494. Yeung TL, Leung CS, Wong KK, Samimi G, Thompson MS, Liu J. TGF-ß modulates ovarian cancer invasion by upregulating CAF-derived versican in the tumor microenvironment. Cancer Res 2013; 73: 5016-5028. Ricciardelli C, Russell DL, Ween MP, Mayne K, Suwiwat S, Byers S. Formation of hyaluronan-and versican-rich pericellular matrix by prostate cancer cells promotes cell motility. J Biol Chem 2007; 282: 10814-10825. Mitsui Y, Shiina H, Kato T, Maekawa S, Hashimoto Y, Shiina M. Versican promotes tumor progression, metastasis and predicts poor prognosis in renal carcinoma. Mol Cancer Res 2017. Wu Y, Siadaty M, Berens M, Hampton G, Theodorescu D. Overlapping gene expression profiles of cell migration and tumor invasion in human bladder cancer identify metallothionein E1 and nicotinamide N-methyltransferase as novel regulators of cell migration. Oncogene 2008; 27: 6679. Pitule P, Vycital O, Bruha J, Novak P, Hosek P, Treska V. Differential expression and prognostic role of selected genes in colorectal cancer patients. Anticancer Res 2013; 33: 4855-4865.